Like most young Australians who find themselves finding themselves in London, a visit to dear old Blighty a few years ago helped me understand my place in the world. Still at an age at which fun could be measured in pints, I found myself in a club at the mercy of a comic whose schtick consisted solely of tormenting anyone within earshot. On my turn to face the music: Where are you from? (Sydney) An Australian in London, eh? (Just so) Then shouldn’t you be behind the bar pouring the drinks? (Touché). My experience may not have been particularly edifying (though it was slightly sobering), but to an earlier generation of artists, writers and thinkers, being an Australian in London meant more than fetching the beers. It meant engaging in a world of ideas that helped shape Australian culture. To a coterie that included Sidney Nolan, Brett Whiteley, Barry Humphries, Clive James, Germaine Greer and others, cosmopolitan London, with its Savile Row highs and Soho lows, offered just the right mix of distance from Australia and proximity to social liberation. It’s unsurprising then, that Francis Bacon exchanged ideas with Australians in the London art world. What’s interesting to think about is whether the influence moved both ways. Did Australians have a formative role in Bacon’s life? Well, as it turns out, yes. Those of us who like to claim Crowded House as our own (and in the same breath divest ourselves of Mel Gibson) will find encouragement in Bacon’s family tree. Bacon’s great-grandmother, the beautiful Lady Charlotte Bacon, had been something of a celebrity during a 12-year tenure in Adelaide thanks in part to a devotional dedication by Lord Byron and this childhood portrait by the English painter Richard Westall. Bacon’s own father, Anthony Edward Mortimer Bacon, was likewise born in Adelaide to an Australian mother. 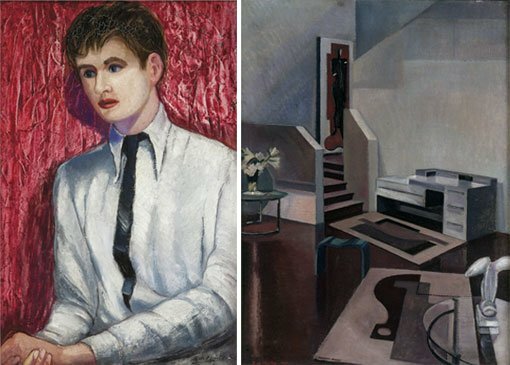 But putting aside facetious claims to an Australian passport, it was Australian artist Roy de Maistre who played one of the first guiding hands in Francis Bacon’s career. If you aren’t familiar with de Maistre, the Art Gallery of NSW collection includes a significant number of his works and he will be an important focus in our coming exhibition Sydney Moderns . From the scant visual record we have of Bacon’s early years as an artist (little remains of his own work), one of the most interesting is de Maistre’s portrait of the artist as a young man. It was probably painted in 1930 shortly after de Maistre, by then an established player in the Australian art and design scene, emigrated to London. It’s a touching, tender portrait of the 20-year-old Francis. There’s something disarming about Bacon’s expression and pose that speaks to an intimacy between the two friends. The young artist’s geometric features and smooth skin may have been the mark of de Maistre’s modernist technique, but there are traces here of a real affection that most likely moved beyond the platonic (the two were almost certainly lovers for a time). If there’s something paternal about this portrait, it’s a reflection of de Maistre’s early professional influence on Bacon. De Maistre may well have helped shape Bacon’s painting technique in this phase and he certainly helped expand his knowledge of art history. More than that, de Maistre helped Bacon secure important furniture commissions, including furnishing the London flat of Gladys MacDermot (an Irish woman who’d lived in Australia) and making pieces for Tory politician Rab Butler (which in 1938 he sold to Australian author Patrick White). Another painting by de Maistre, of Bacon’s Queensberry Mews studio, is no less intimate. With its intersecting spaces, confounded perspectives and surface sheen, this painting seems all de Maistre, but there is something important about Bacon’s early life that is documented here too; a reflection of the purity of his early design work and the origins of his line and form that provides a counterpoint to the mass of chaotic images that are so well-known of Bacon’s subsequent Reece Mews studio. Of course Bacon’s work has had a huge impact on Australian artists past and present. Emma Collerton has already written about the friendship between Bacon and Brett Whiteley on the Gallery blog. In the catalogue for Francis Bacon: five decades , Martin Harrison and Rebecca Daniels look at Bacon’s Antipodean associations, including his relationship with de Maistre, in more detail. One of the fascinating questions they raise is whether Bacon was influenced by Sidney Nolan’s paintings Death of a poet 1954 and Mrs Fraser 1947. Could Bacon have found inspiration in another of Australia’s greatest painters? It’s a tantalising prospect. When I think back to my own London experiences – and I think Bacon would approve of this – I realise how important chance encounters are. Young Australians mooching around London bars may well be one of the cultural clichés of my generation but there’s value in people from opposite sides of the world going tête-à-tête over a pint. Come to think of it, the same conversations could well have been had by Francis Bacon with Australians over the bar at Muriel’s a half century ago.